I have had many parents ask me when should my child get their first exam and what can really be checked when they are so young? Just like a child learns to walk and talk children have to learn to see. Their visual system is being molded as they develop and if they do not have the proper foundation their development for good vision may be hindered. 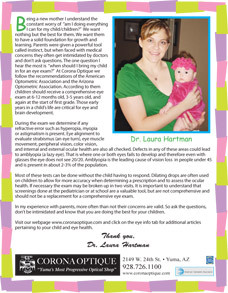 Children should receive comprehensive eye exams at 6-12 months old, 3-5 years old, and again at the start of first grade as recommended by the American Optometric Association, the Arizona Optometric Association, and here at Corona Optique. It is surprising to most parents that many components of a child’s vision can be examined. Items usually checked in a pediatric exam are vision, eye alignment, eye muscle movement, peripheral vision, pupils, color vision, refraction (checking for a prescription), and external and internal health of the eye. Parents should be aware that some children may require at least two visits to complete their exam. Drops are also often needed for examining children. The drops allow for the doctor to get an accurate prescription and a better assessment of ocular health. In the first years of life it is very important to detect any eye problems. Refractive error such as nearsightedness, farsightedness, or astigmatism is prevalent in about 15-20% of the population. Excessive refractive error can lead to amblyopia (lazy eye). Ambyopia is the leading cause of vision loss in people younger than 45 and is seen in about 2-3% of the population. Strabismus, also known as an eye turn is prevalent in about 3-4% of the population and can also lead to amblyopia. Eye disease affects just under 1% of children and should be checked early so that treatment can be initiated. It is important to understand that school screenings are valuable, but are not comprehensive eye exams and many conditions can be missed during these screenings.